Gov.-elect Greg Abbott and Lt. Gov.-elect Dan Patrick will officially drop the "elect" from their titles on Tuesday during an elaborate daylong inauguration celebration that has been months in the making. Abbott will become the 48th governor of Texas, taking over from outgoing Gov. Rick Perry, who — as Abbott did in the attorney general's office — held the position longer than anybody preceding him. Cecilia Abbott will also make history, becoming the first Latina first lady of Texas. As the state's 42nd lieutenant governor, Patrick, who served eight years in the Texas Senate, will replace Lt. Gov. David Dewhurst, who lost to his successor in a heated primary battle. Organizers set a $4 million fundraising target and began planning the festivities immediately after November's elections. They expect 30,000 to take part in at least a portion of the proceedings. First on Tuesday's agenda is a prayer service, to which underwriters of the day's events could receive two VIP tickets for a $50,000 "gold star" donation, or four tickets for a $100,000 "platinum star level" donation. 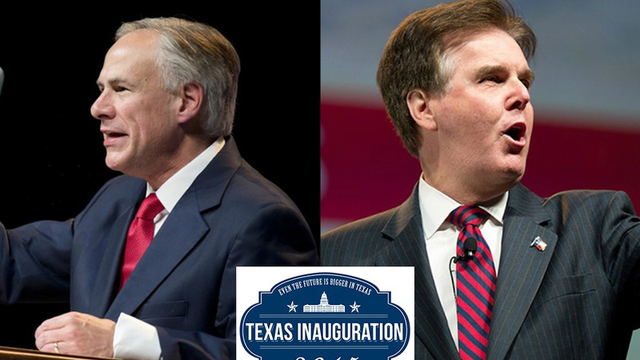 The official ceremony at which Abbott and Patrick take their respective oaths of office will be held in front of the Texas Capitol and will be open to the public. A barbecue catered by Eddie Deen, a Dallas-based company that has fed attendees at previous gubernatorial inaugurations, will follow. For those paying $10 for a ticket to lunch, four tons of brisket have been ordered, along with more than two tons of potato salad, one ton of smoked chicken breast and 340 gallons of red pinto beans. A parade will then proceed through downtown Austin. Among the roughly 30 floats or groups participating will be the boy scout troop Abbott belonged to as a boy and the Duncanville High Hats, a drill team from the high school Abbott attended. The official festivities will conclude on Tuesday evening with the "Future of Texas Ball" at the Austin Convention Center. Country music stars Pat Green, a San Antonio native, and Lady Antebellum, a band hailing from Nashville, will provide the entertainment for roughly 10,000 expected attendees. On Wednesday, Abbott and Patrick will begin work in their new positions atop the state government's organization chart. In an interview last week, Abbott told The Texas Tribune that in the initial days of his governorship, he intends to focus on the "bread-and-butter issues that will continue to keep Texas on a pathway toward being the best state in the nation." He said those include improving the state's education system, securing the border and investing in transportation infrastructure. Observers of the Texas Senate are waiting for Patrick to release his assignments for the upper chamber's committees. Sources have told the Tribune that those assignments could be coming sooner rather than later, and that there could be as many as six fewer committees than last session.